Do You Remember... "The Monroes". Twin) and Tammy Locke as red-haired six year old Amy Monroe in the wild Wyoming Territory of the 1870s. Expensively filmed mostly on location in Grand Teton National Park in Wyoming, the Monroe family homesteaded land their late father had staked out years before. Trouble was, their property was in between that of a pair of make-your-own-law feuding barons—Liam Sullivan as the very proper British cattle baron Major Mapoy who was rich and employed people who made sure he got his way including James Westmoreland (aka Rad Fulton) as rough Ruel Jaxson (who is smitten with Kathy Monroe); and Robert Middleton as brutish horsebreeder Barney Wales, with his two sons James Brolin and Tim O’Kelly. Both Sullivan and Middleton try to buy out the Monroes but the kids stand their ground and attempt to make a life in the wilderness. Ron Soble played the Monroes’ Indian friend and sometime protector Dirty Jim in some 19 of the 26 one hour color episodes aired on ABC Wednesday nights from 8-9 Eastern time from September 7, ‘66 to March 15, ‘67. Following the popular “Batman” on Wednesday nights should have given the well-liked “Monroes” good ratings, but there was very stiff competition from the last hour of the 90 minute “Virginian” on NBC and the last half hour of “Lost in Space” and the first half hour of “The Beverly Hillbillies” on CBS. All socko ratings winners. 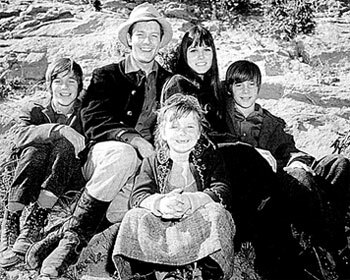 Others in the recurring cast were one-armed cowboy Ben Johnson as Sleeve (friendly to the Monroes), Buck Taylor as Bradford, Dub Taylor as Cyrus and Lisa Jak as Lorna (Middleton’s daughter) alongside top name guest stars. Gene Forest Sturlin, May Boss, Joe Canutt and Jack Williams handled the majority of the stuntwork. Much of the music came from Harry Sukman. Directorial and script work was spread among 13 directors and 22 writers. Unable to develop a sufficient audience the series ended after 26 episodes, although Michael Anderson Jr. and Barbara Hershey both won American Heritage Awards for their fine work on “The Monroes”.